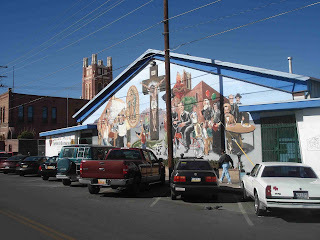 My experience in El Paso was both very favorable and very productive for my research, so I definitely can't complain. That town has a very distinctive feel, which is just another reminder of the vastness and diversity of the U.S. and which makes the whole country so damn interesting. El Paso also feels a lot different from South Texas, which figures since it is 550 miles to San Antonio, for example, and I think it is different than other places I've been in the southwest. The look of the city, the feeling on its streets, the overall vibe in the places I visited all make for an interesting experience. Lots of good murals, too, it is a visually interesting city despite the generally dusty and or rundown vibe in large parts of it. Some nice vistas when you get up in the mountains too. 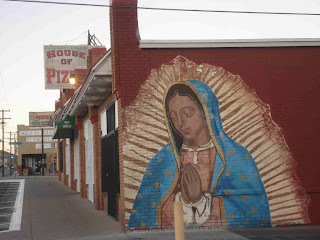 You could call this "the obligatory Virgin of the Guadalupe picture", but it is worth noting that this is on the side of the House of Pizza. I need to go back and take the time to scour the whole city for murals for myself. I have a feeling this has been done. (yup-- right here, for instance or this.) I simply did not have the time to do it since it was long since dark when I got done everyday until the last day (I was maximizing time losing my eyesight on old documents and microfilm). So, I didn't get to explore the city as much as I would have liked, but I did get to explore a bit. I stayed right downtown in one of the oldest hotels in the city, was the El Paso Hotel now called the Camino Real. I like these grand old and now slightly shabby hotels. And El Paso still has a downtown, albeit one that shuts tight at 6, at which point it is a ghost town. But during the day the streets are absolutely packed. This is in big contrast with Juarez across the river, which is reportedly empty. I didn't go over there, in part because I didn't have the time and in part because I didn't have the inclination given what is going on. I wish it weren't so but it is. I was interested though not surprised to hear people talking a great deal about the violence over there. 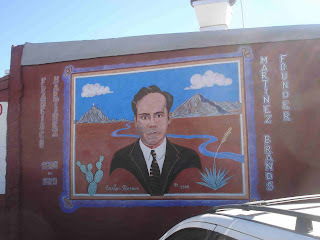 During the week I was in El Paso there was a spectacular murder of a new police official and a body with head wrapped in plastic found in the Rio Grande. Over the weekend there were 20 murders, including 2 cops. The El Paso Times had some broad coverage of it on Sunday. "When the drug war in Juarez began earlier this year, everyone thought it was a fleeting thing, that life would get back to normal after a couple of months and a few executions. The cartels, officials predicted six months ago when the number of dead was 400, would simply go back to their business of smuggling dope into the U.S. Instead, in the past year, Juarez has become one of the most violent cities in the world -- certainly in the Americas -- with more than 1,500 homicides, a number that escalated starting in the middle of the year. "No one could imagine that this was going to happen, much less to this extent," said Jaime Torres, a Juarez city spokesman. "What we are seeing on a daily basis is surprising and stunning. No one was prepared for this, and it has changed this city." # The streets are now patrolled by armed soldiers riding on top of pickups. # Some businesses, including pharmacies and doctors' offices, lock their doors during the day, opening only after a customer is checked out. # Restaurants have but two or three guests during the day. At night, most restaurants are closed. 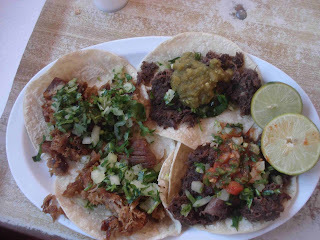 # More than half of the stalls in the city's major mercados are empty. # And Avenida Juarez, the tourism district known as the Juarez strip, is void of tourists, even on weekends and weekend nights. Manuel "El Manny" Gonzalez has a front- row seat on Avenida Juarez that allows him to see what is happening to his beloved town. For 15 years, he has spent his weekends shining shoes and selling cigarettes on the strip at the foot of the Paso Del Norte port of entry. Sandwiched between the Kentucky Club, Tequila Derby and the Caliente Club, Gonzalez used to be a busy man. At night Dec. 13, the only people in the area around him were club workers and taxi drivers. "There are no more Americanos," he said. "No more students, no more soldiers. Look around; there is no one here. It started in January and has slowly gotten worse." Some blame the U.S. economic crisis, others the peso devaluation, and others the U.S. for forcing U.S. citizens to have passports to re-enter their homeland. But mostly, Juarez residents say the drug war has them scared, scared of going out, scared of being targeted. "With what is going on, no one wants to be in the wrong place at the wrong time," said Juarez resident Ofelia Gomez Lucero, who was getting on a bus across the street from City Hall on Monday. "By 6 at night, the streets are empty. El temor existe (The fear is real.)" I am quite sure it would take many more moons there to locate the best spots. I can definitely commend Gussie's Tamales as an ideally realized food. 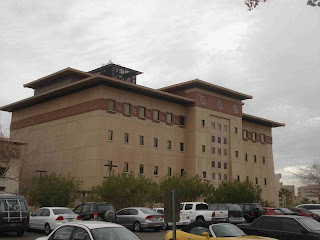 I was doing research at the University of Texas at El Paso. It is worth noting something that was a big surprise to me: the whole campus is built using Buhtanese style architecture. It's true. Bhutanese architecture features "dzongs," or fortresses, square or rectangular stone buildings first built around the 12th century. Belonging to large, powerful families, these castles were inhabited by local lords who ruled over their lands. In the first half of the 17th century, the dzongs began to act as monasteries as well. The dzongs in Bhutan were built in strategic places such as the meeting of two rivers, the top of a hill or at the entrance of a valley. Some are quite intricate, having been built in stages and being comprised of up to 20 temples. Steep walls slope inwards and roofs form broad overhanging eaves. Black-rimmed windows inaccessible from the outside stand out from the massive white walls. A wide red stripe just below the roof indicates the religious nature of the building. White referred to these fortress-monasteries as "castles in the sky." In a Bhutanese dzong, the large inner courtyard is surrounded by buildings of two or three stories, and a huge tower known as an "utse" stands in the middle, housing the various temples. A photograph by White of the "Paro Dzong" supposedly is the inspiration for Old Main. The low hipped roof, the ornamental frieze of tile and brick just below the roof interrupted by the windows of the top story, and the "battered walls" which increase from top to bottom by seven inches per ten feet are among the major Bhutanese features of this building. Trost agreed that the stark, simple architecture of Bhutan fit the terrain and climate of the Southwest, especially the mountainous site of the new school. In 1917, Old Main was built, and is now a national landmark. The other buildings included the chemistry building, a dormitory and the power plant. Trost also designed a fifth building, Kelly Hall. 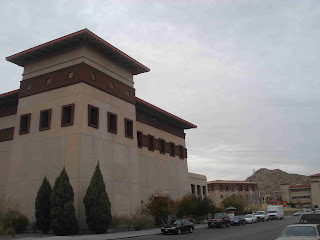 Most of UTEP's buildings reflect Bhutanese influence, including the Business Administration building, the Library and the more recent Undergraduate Learning Center, completed in 1996. Miner Village, the new dormitory complex set to open in fall 2001, features 12 dorms also in Bhutanese style. For most of the campus, however, traditional architecture has been copied from Bhutan down to the prayer wheels in front of the museum. Every detail has been replicated except for the fact that the Bhutanese built their massive structures without the use of nails or blueprints. [I love that detail] El Paso and its university have the distinction of being the only location in the Western Hemisphere to reproduce Bhutanese architecture." I had no clue. Kind of interesting, isn't it? 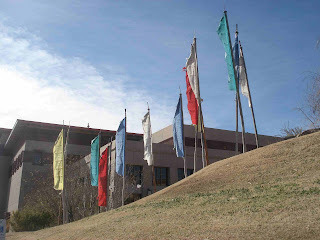 The scale of the buildings is quite large, and in addition there are prayer flags and many exhibits scattered around. 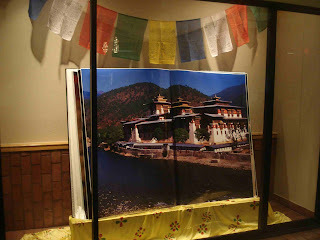 There is also a huge book with photographs of Buhtan on display in the library. It is the largest book in the world, 133 pounds. (a Texas sized book, if you will). Ok, but what the hell was I doing there amidst all of those Bhutanese splendor? I went to find materials on the Cutting Case, as I mentioned, and also material on the Mexican Zona Libre (free trade zone) and the American response to it. UTEP and the city public library both had a bunch of material that doesn't circulate and which is not elsewhere, so there were some rich pickings. Part of the fun of doing research is happening across all manner of other random stuff too. Makes it hard sometimes to stay on target, but, of course, many times it is the odd little thing you pick up that launches a new project. I was poking though the El Paso County jail records from the 1880s and was amazed to find that the official record book had columns inquiring if the prisoners escaped or were discharged, and another column that asked for the actions taken after the escape. This was a common occurrence-- a huge number of the prisoners in the early part of the decade! There didn't seem to be any connections between escape and where people were from. I thought maybe most of the people were Mexicans who used the proximity of the border to escape. But there were many others: Andy O'Brian from Ireland, arrested for assault and attempt to murder on Dec 9, 1881, escaped, James Jackson, an African-American from Kentucky, in for forgery Jan 4, 1882, escaped. W. Bowers, arrested 18 Feb 1884, "very heavy square built"
Wm. W. Goodrich, 33 years old from NY, remarks: "Insane just released from Lunatic Asylum in Mars" in for "swindling, committed to jail, Feb 27, 1884. Fal Johnson, a mulatto "Two middle fingers on Right Hand off and Left Eye out" Aug 29, 1884, wanted for a murder in Huntsville, TX. W. Cresswell, "3 fingers off Left Hand" American in March 28, 1885, "assault with attempt to murder"
Sim Lum "Chinaman" arrested Aug 24, 1885, reason was "made mischief". 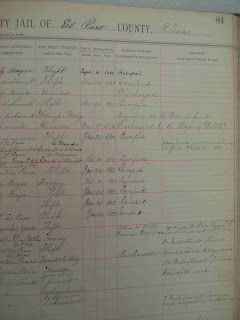 Gussie Manning, under "county or state in which born" it says "nice girl" under special marks it says "prostitute". 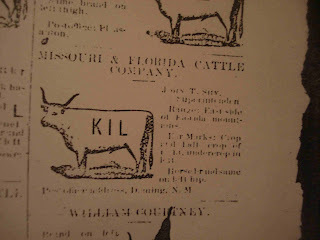 This nice girl was in for "Contempt" Jan 21, 1886. The next entry is for Mrs. Sallie Ann Thompson, under County or state is just " " and also under remarks: " " so apparently she was also a nice girl and a prostitute!—though as in for contempt! Sing Fiao, "Chinaman" in for assault, Feb 4, 1886. O.T. Green, Feb 1, 1886, indicted for "interfering with dead body". 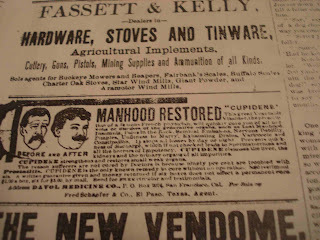 I also read a lot of newspapers from the 1880s-1905 or so. I love reading these old papers (one reason I wrote a book on an editor), and very often in the pursuit of a specific topic you stumble across some real wonders. 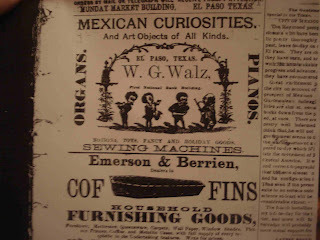 this 1886 "Mexican curiosities" ad and the coffin ad. There were many different ads for coffins in these years. 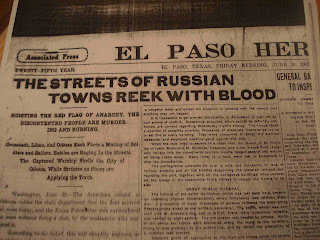 This headline during the Russian revolution of 1905 (the same time the zona libre was abolished, incidentally) is great. Wants to Kill a Huge Elephant with Electricity at El Paso." 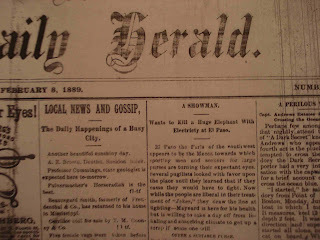 and with this great opener: "El Paso, the Paris of the southwest, appears to be the Mecca towards which sporting men and seekers for large pursues are turning their expectant eyes." It seems that Col. J.H. Wood had a particularly ornery elephant that was responsible for the deaths of fourteen keepers "and to punish him for his past misdeeds and prevent any more in the future he has determined to kill him by electricity" in a public show. The paper notes that "HERE IS A GREAT OPPORTUNITY" to see what they call, in quotes "the elephant".